Bengaluru: Billion, the personal Make In India, private label project of Flipkart co-founder Sachin Bansal, has now been rolled into the overall private brands business of the online retailer. The move comes weeks after the former chief executive exited the company following a bitter tussle with the board during its acquisition talks with Walmart Inc. in April. Billion is now part of a portfolio of eight private label brands, which are being overseen by Flipkart executive Adarsh Menon. Prior to Bansal’s exit, Billion stood apart from the other private labels and was being run as an independent unit by him. In an interview, Menon indicated that Bansal’s vision for the brand would stay intact and there would be no change in Billion’s go-to-market strategy. “The space that Billion has very successfully created and occupied for Indian consumers is the space of Make in India and Made in India. And that’s an extremely rich asset that the brand has. That can enable it to travel across multiple categories, which speaks volumes about how strong the brand is. What Billion will continue to do is identifying very India-specific customer requirements, and then working with our ecosystem partners to deliver that to Indian consumers," said Menon, vice president, private labels, Flipkart. 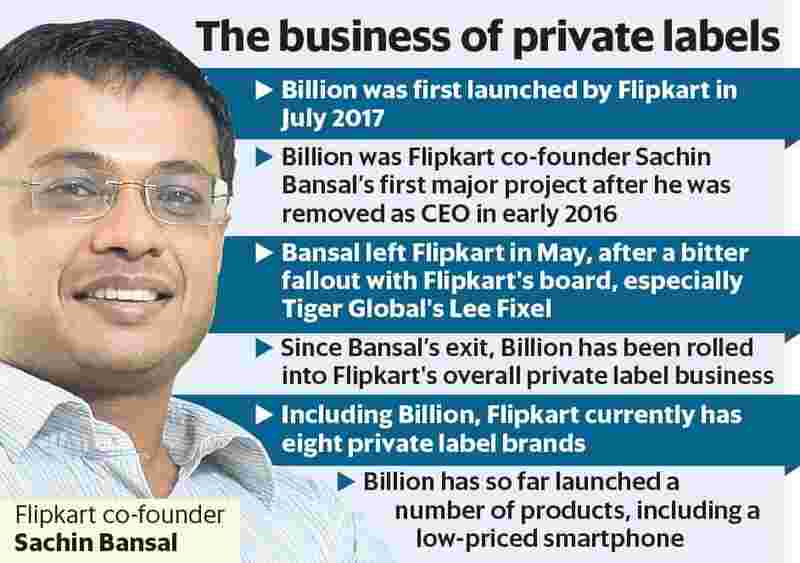 After Bansal’s departure, Flipkart chief executive officer Kalyan Krishnamurthy had reorganised the private labels business and decided to integrate the 50-member strong Billion team with the private label organisation. Billion was Bansal’s big project after he was forced to cede the CEO’s role to Flipkart co-founder Binny Bansal in January 2016, after a disastrous year in which all his major strategic bets failed and the online retailer ended up losing ground to arch-rival Amazon India. A year later, Binny Bansal himself was replaced by former Tiger Global Management executive Kalyan Krishnamurthy. Mint had first reported in June 2017 that Bansal had started building Billion as a budget brand across categories, including electronics, appliances and accessories, to attract new shoppers to Flipkart. At the time, Bansal was also working on a low-priced smartphone under the Billion brand to compete with the likes of Xiaomi and Micromax. Flipkart eventually launched the smartphone in November last year. Under the Billion private label, Flipkart has also launched mixer grinders, cookware, backpacks and irons, and will expand to other categories in the near future. Under Bansal, Flipkart had positioned the brand as a value-for-money offering. The name Billion was also a favourite of Bansal’s—the company’s flagship sale event is called Big Billion Days. In the business of e-commerce, private labels are an important asset for top online retailers, since such brands typically offer fatter margins to marketplaces than third-party brands. For Flipkart, the launch of Billion and other private brands was part of a strategy to increase sales from private label products. Mint had reported in May that Sachin Bansal left Flipkart after a disagreement with the company’s board led by Tiger Global Management’s Lee Fixel during its negotiations with Walmart. At the time, Bansal had demanded stronger shareholder rights and a bigger operational role in the acquired entity -- something that was strongly opposed by Fixel and the rest of the board. Bansal was eventually forced to sell his entire stake in Flipkart, sign a non-compete clause with the company and abruptly depart from the company he co-founded in a small two-bedroom flat in Bengaluru. The manner of his exit from Flipkart was so acrimonious that his name was not even mentioned once in Walmart’s press release announcing the Flipkart buyout.